King Street West in Toronto has now become one of the most reliable streets when it comes to discovering the best and trendiest restaurants this city has to offer. With top restaurants lined up side by side as far as the eye can see it is no wonder why this street has been notably coined “Restaurant Row.” I was recently invited to try the food at a fairly new restaurant called Parlor Foods & Co on this very street around the corner of Blue Jays Way and King Street West and my experience there was nothing short of amazing. Closing in on their 1 year anniversary this coming November, Parlor Foods & Co specializes in local cuisine with an ever changing ingredient driven Canadian menu. Their slogan is even “True North Strong” so as soon as you step into this barn boarded restaurant with a tree trunk inspired doorway, you know you will be in for a real treat that only Canadians will know and truly appreciate. My guest and I arrived at our designated time and were sat at a table just in front of their outdoor patio where we were were then immediately greeted by the bartender Japhet Bower and one of the co-owners of the restaurant Jason D'Anna who both graciously took care of us the entire night. What came out first to start our dinner were two of their signature cocktails, the Smoked Maple Manhattan ($14.25) and their Sangria ($11). The Smoked Maple Manhattan was a complete joy to receive as the cocktail is quickly put together right in front of your eyes at the table. The concept of an open campfire comes into play where pieces of dry wood are torched and then the cup is placed over the smoke to create the smoky, nutty flavour this Manhattan has (check out my video below!) Their Sangria on the other hand was a nice compliment to the smoky, hard liquor of the Smoked Maple Manhattan where this brought a refreshing and colourful cocktail to the table through the cucumbers, watermelon, sprite, dried Ontario Rose, and shaved fennel that topped it all off. Next up was their signature Charcuterie Board ($19). I admit, I came in that night not a huge fan of charcuterie. 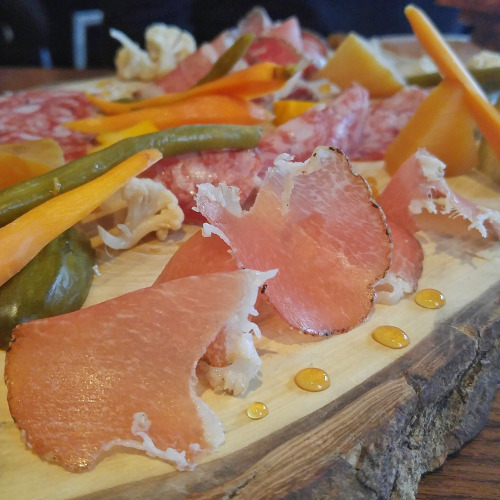 To me eating essentially cold cuts was not exciting nor something that blew my mind taste wise, but boy was I ever proven wrong here at Parlor Foods. The charcuterie was presented to us like a piece of art, placed on this beautiful slab of wood where all the meats, pickles, breads, and sauces all served a purpose, not one ingredient out of place. Their selection of in-house cured meats included Nduja, Veneto Salami, Mortadella, Horse & Pork, finished off with some pickles, smoked maple syrup, grainy mustard, and fresh bread. It was fun to also try to pair different ingredients together, different combinations with each bite creating various flavours in your mouth time and time again. This is the one dish I have been recommending to all my friends now over and over to order here. Loved it! Up until that night I have never eaten bone marrow or horse before. This quickly changed when we were served with another signature dish of theirs, Horse and Bones ($25), a dish that has been on their menu since their opening. The bone marrow is accompanied by a horse tartare on top where the escabeche and egg marries all the ingredients nicely together creating a very unique dish I have yet to see anywhere else. Potato crisps are served on top of the tartare and should be used as a vessel to eat all of the ingredients together at once. It took me a quick second to wrap my head around eating horse meat, but that skepticism quickly faded after the first bite with delicious flavours all around. The Street Meat ($18) came up next to our table and it was a duo of savoury summer sausages on buttermilk buns, fresh slaw, pickles, pickled jalapeno, and ball park mustard. This is not your average hot dog you can find outside at the street vendors and it really packs the heat. If you cannot handle spicy, I would recommend you avoid this dish as the pickled jalapeno really brings the heat and spiciness to this dish. Of course you can always pick them out yourself with your hands after so do order this at your own risk for all the spicy averse people. The last main course that we were served for our dinner was their BBQ Short Ribs ($26). This dish was perfection. The short ribs fell very easily off the bone and beaming with flavour from the peach and rye glaze. My favourite part of this though was the corn & scallion grits layering the bottom of the plate which was creamy and smooth with each bite. My version of comfort food right here. This dish was then finished off with sauteed broccoli, Iceberg lettuce, and crispy onion strings. Last but not least came the dessert and it was certainly worth the wait. Their Daily Doughnuts ($8) came out fresh from the oven as it was still very warm to the touch with a crunchy, outer exterior. Depending on the day and what the chefs at the back end of the restaurant are inspired by, the flavours of the doughnuts do and will change. Ours that day was a play on peanut butter and jelly and it was superb! We were also then given a scoop of their made in-house Parlor Ice Cream ($5) with the most creative, tasty, and awesome of flavours, whisky! Right? I couldn’t believe it either. It has a very settle alcoholic taste to it so don’t worry about getting drunk off of this, but the whisky flavour is there and it tastes incredible and surprisingly blends in perfectly as an ice cream flavour. I really hope one day they start selling their homemade ice cream in take-home containers for us because I will be the very first person in line to buy it. Parlor Foods & Co just hit all the right notes for me. It’s just simple Canadian food done right. A fine dining experience in a casual, laid back atmosphere. 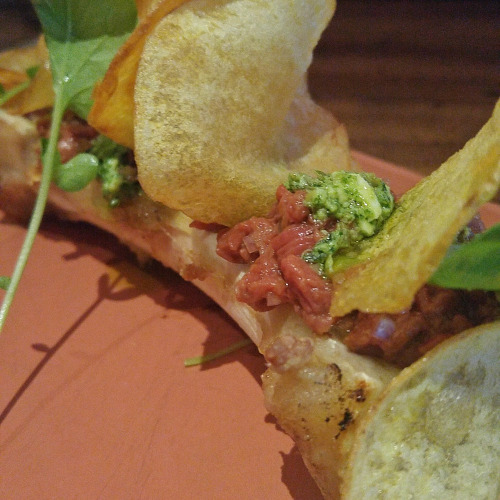 I mean where else can you eat bone marrow and horse tartare while sipping on the finest cocktails all the while cheering for the Blue Jays to win the World Series on their big screen TV. It just doesn’t get any more Canadian than that. When I get asked to recommend a Toronto restaurant to either family, friends, or other foodies, there has always been one restaurant on the top of my list which was Richmond Station. With this past experience here at Parlor Foods & Co, I think it is safe to say that a new player is in town which has sky rocketed to the forefront of my list of favourite Toronto restaurants. Don’t be surprised if you hear Parlor Foods & Co come out of my mouth when you ask me for a restaurant recommendation. All you have to do now is just go. You won’t regret it.